Today's Saturday Photohunt theme is *CELEBRATE* . . . I suppose it should have been *DREAM*. You know where to send him on Friday. He can come with me. Who knows what he might see JUST as I'm found? Allie: *sigh* A girl can dream, can't she? Maxwell: Allie, you're sure doing a lot of sighing lately. Katie, I think you are the only one by now that Waffles Too hasn't won over! You know, that is probably just going to make him try harder! Give him just a little more time Katie, just a little more time. We have a feeling your celebration will only be in your dreams ... Try to have a good Caturday anyway! Have a super Saturday. Thank you so much for your contribution to Madis' big day. It is on our blog this morning. Mom and I thank you very very much for the most beautiful graphics you provided for my Swearing in ceremony today. The mayoral office will keep your information on file for future use. Popped over from Molly the Wally. This looks like a fun blog! Heh heh! Good one! I'm gonna be celebrating my 7th Gotcha Day soon so maybe I should participate. 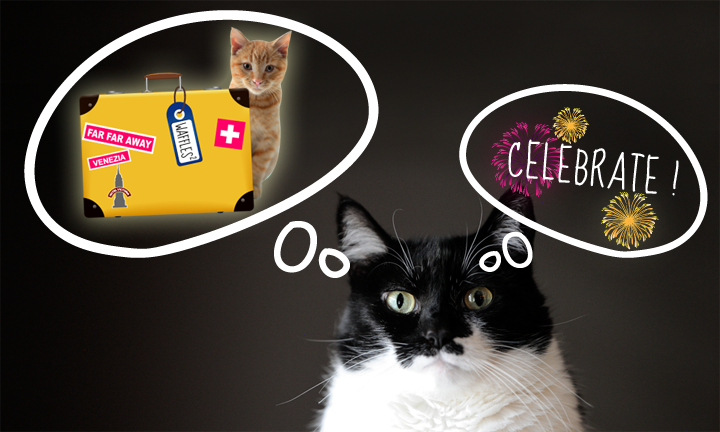 Where are you dreaming of, er, celebrating the dream of sending W2? Oh dear... Katie you simply must let it go... Waffles Too cares not one wit how you feel. Maybe you could learn to conspire with him to get even more stuff from your humans. Clearly they have been completely blindsided by his cuteness and will give him whatever he wants. With your brains, the skys the limit, I tell you!!! Hi Katie, we'll take Waffles Too for a few days. We're ready for you..better pack your winter coat. It's sunny with a "day time high" of 37 degrees. We're in line for Waffles Two, too! Katie, you know you would miss him if he really did go far, far away. Right? Right???? Oh Katie! Surely you don't mean that. Good luck with that one Katie! Katie, I know just how you feel! Now what would you have to complain about if Waffles Too wasn't around, Katie?? Katie! Wowwzers! Yous has the same dreams about your little brother as me has about mine! Coincidence or something to celebrate? MOL! Katie, you are too funny!